Only FOUR more days! That's right... on Friday, to coincide with the release of the movie, Roaring Forties Press is publishing Rome's Angels & Demons: an Insider's Guide -- a free ebook with inside information about the art and places in Dan Brown's book. And you will be able to get your FREE copy right here! Raphaello Sanzio (1483–1520), the son of a painter, grew up in Urbino. As Langdon notes, he is also known as “Raphael Santi.” Raphael came to Rome to perfect his craft as an artist; he studied under his cousin, Bramante, and took over as architect of St. Peter’s Basilica after Bramante’s death. Raphael was known as a lovable and affable fellow with a penchant for the ladies. Indeed, on more than one occasion, his lust for women interfered with his work. Agostino Chigi was one of Raphael’s patrons, and he, too, shared Raphael’s amorous tendencies. When Chigi employed Raphael to create frescoes in his summer home, Villa Farnesina, Chigi provided the artist with living quarters at the villa because it was so close to the home of Raphael’s lover. In fact, the story goes, one day Raphael and his beloved were enjoying each others’ company when Michelangelo stopped by. The two were so engrossed in their passion that they did not notice Michelangelo, who picked up a brush and completed a figure in the fresco before leaving. 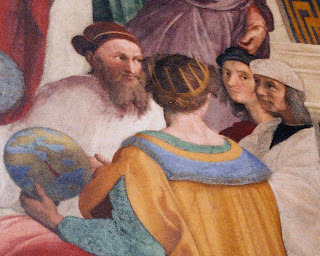 Chigi also commissioned Raphael’s work on the Chigi Chapel at Santa Maria del Popolo—the First Altar of Science on the Path of Illumination. Rome's Angels & Demons: an Insider's Guide is filled with information about the historical figures, churches, artwork, and locations that figure prominently in Angels & Demons. With maps, visitor information, photographs, and in-depth insights, it is a great guide to the city of Rome and the fascinating world Dan Brown has created. Check back here tomorrow for another glimpse into Rome's Angels & Demons, my free guide for book and movie lovers everywhere!